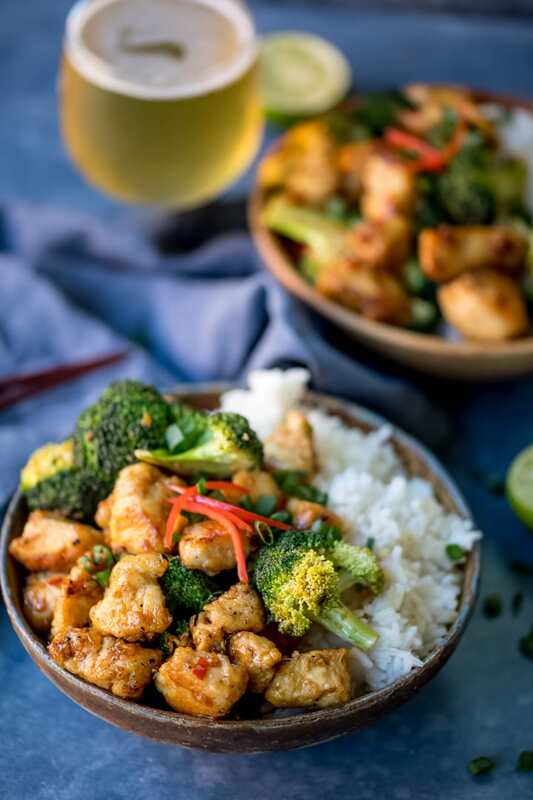 Crispy Chilli Chicken with Broccoli. 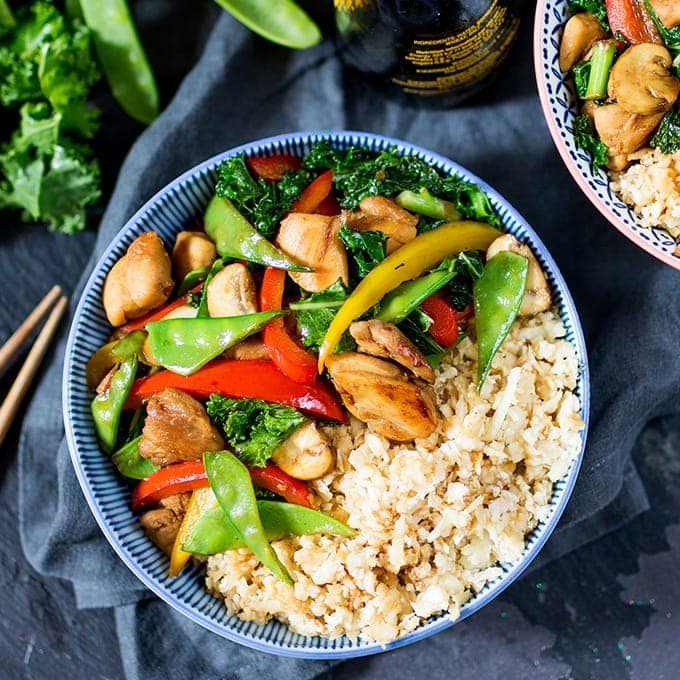 A quick Asian-style chicken stir fry, ready in 20 minutes! Including gluten free instructions. 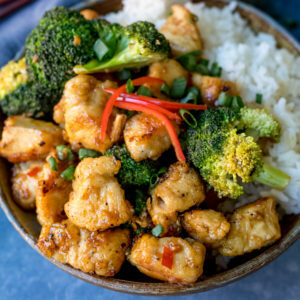 Oh man I love making Asian recipes this meal is no exception. It’s based on my the crispy chilli beef recipe (Chris’ number one request at dinner time). Today I’m changing it up a little with chicken for a slightly lighter version. 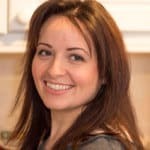 As a blogger, I create a lot of different recipes for Kitchen Sanctuary and for other websites too. That means we’re usually eating something different at least 3 or 4 times a week. This recipe (and the beef version) is one of those old favourites on my regular recipe rotation list for those days I don’t have to cook up something new. Super quick to prepare and easily made gluten free too. I put the rice on first, then everything else is cooked and ready by the time the rice has finished cooking. Fry in hot oil in a wok until crispy. 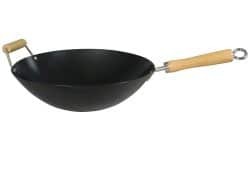 Then remove from the wok. 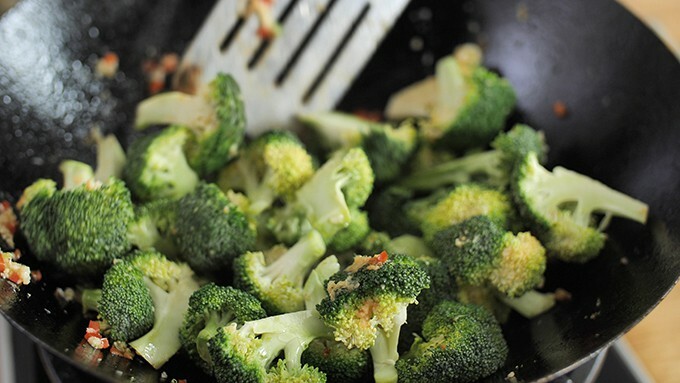 Followed by broccoli and chillies (chillies are optional – if you don’t like it hot, leave them out). 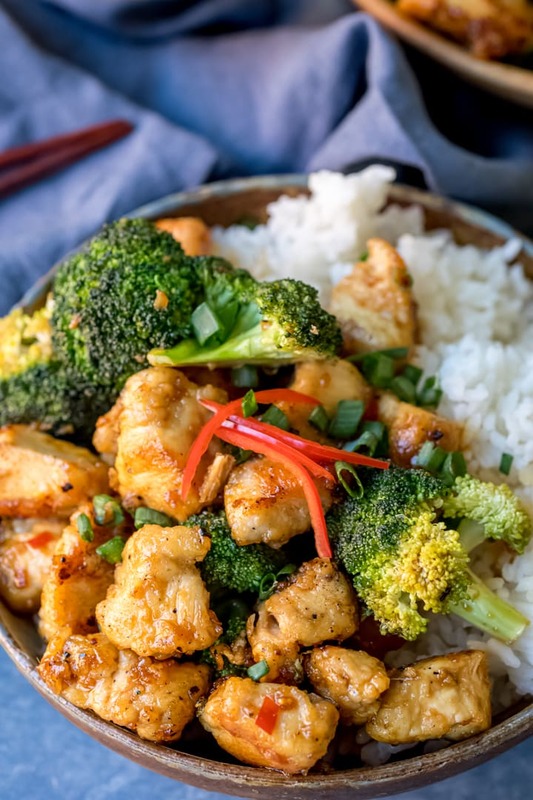 Remove the broccoli from the pan and add in the sauce. Let it bubble for a few minutes until reduced and syrupy. Then add the broccoli and chicken back and stir. Then serve with the rice that should just have finished cooking! You can also make this using leftover meat from other meals. 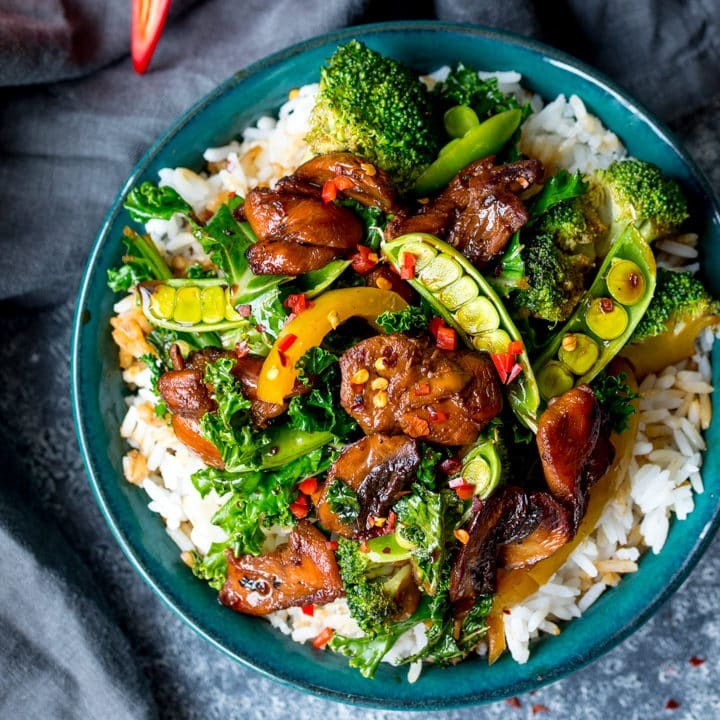 If we have a roast dinner and there’s leftover cooked chicken/beef/pork and even lamb, we cut it into thin slices and freeze, ready for making an even quicker version of this meal. One of my friends tested it out with prawns too, and it worked a treat! 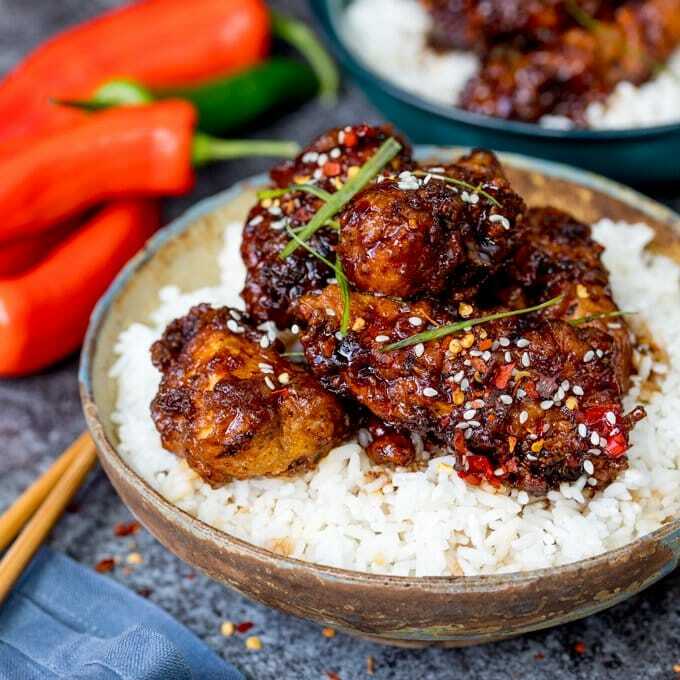 Fancy a super quick and easy desert after this quick and easy Crispy Chilli Chicken? then why not try my Caramel Chocolate Mug Cake or my PB&J Mug Cake. 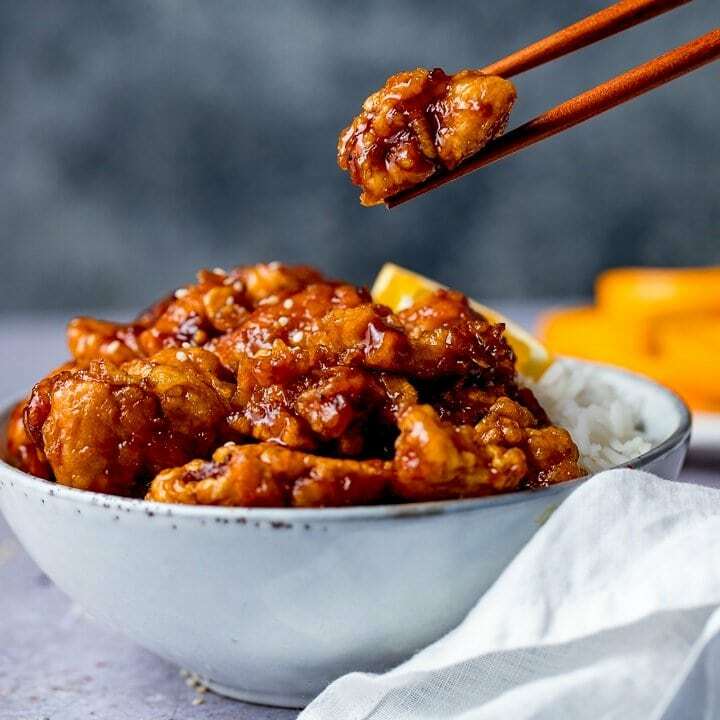 If you love this recipe then you definitely need to try my Crispy Sesame Chicken, its one of the most popular recipes on the blog. 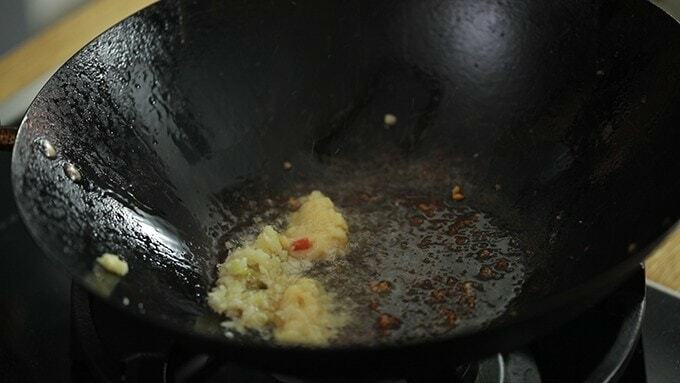 Heat the oil in a wok or large frying. 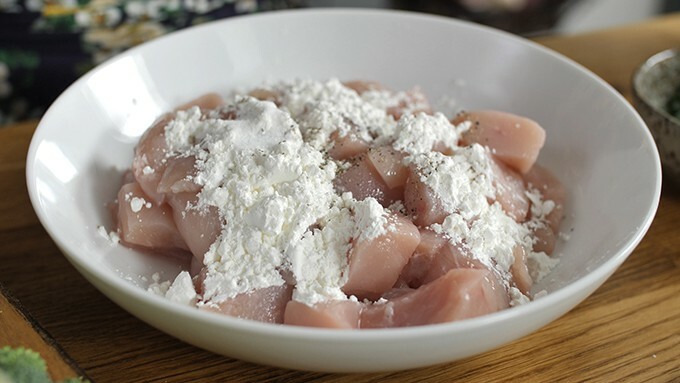 Mix the salt and pepper with the cornflour and toss the chicken strips in the cornflour until completely coated. When the oil is hot, tip the chicken in and fry until golden brown and crispy. You may need to do this in two batches. 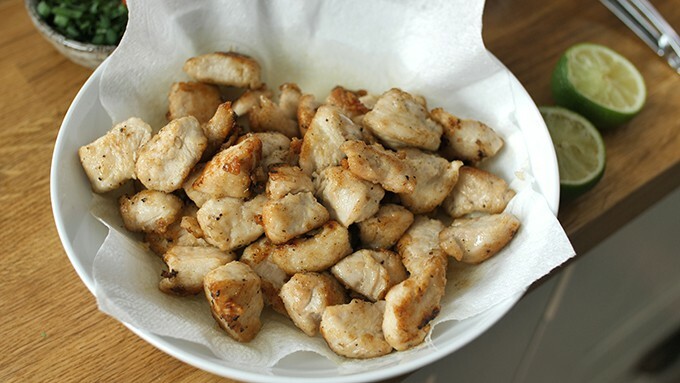 Using a slotted spoon, remove the chicken from the pan and place in a bowl lined with kitchen roll to soak up excess fat. There should still be left some oil in the pan at this point. You need about 1 tbsp, so carefully discard some if you have more than that. 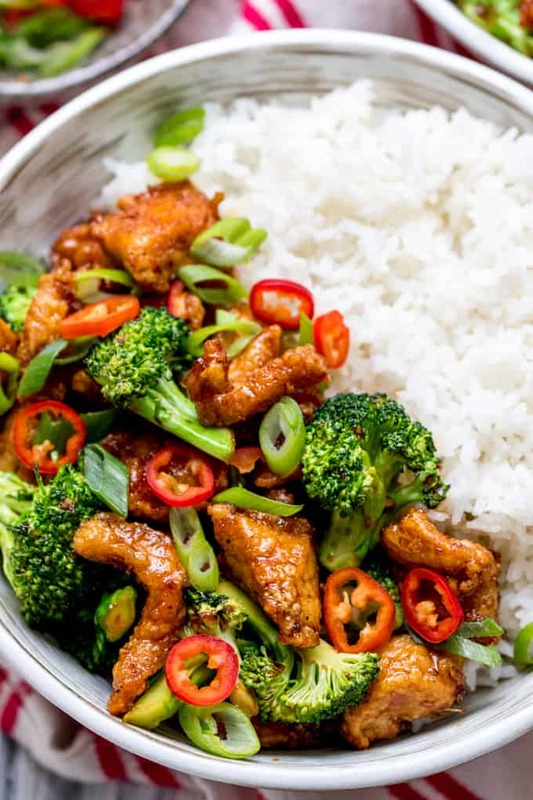 Take the wok off the heat or turn it down very low and add in the ginger and garlic (the garlic will burn if you have it on a high heat), give it a stir for 30 seconds and then add the broccoli and chopped chilli to the pan. Fry for a 2-3 minutes, so it's warmed through but still crisp. 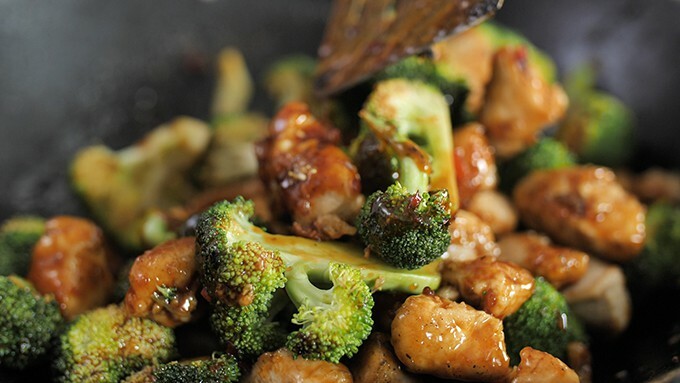 Then remove the broccoli from the wok. 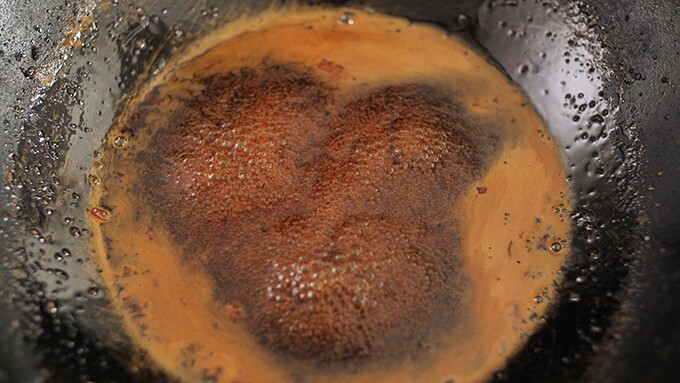 Mix the lime juice, soy sauce and sugar in a small bowl, then pour onto the wok. Turn up the heat and let it bubble for a couple of minutes until the sauce starts to reduce and thicken (see note below if using tamari). Add the chicken and broccoli back in, give it a stir and heat through for 1 minute, then serve with boiled rice. Garnish with the spring onions and more chopped chillies. *Can I make it gluten free? Yes, replace the soy sauce with tamari. 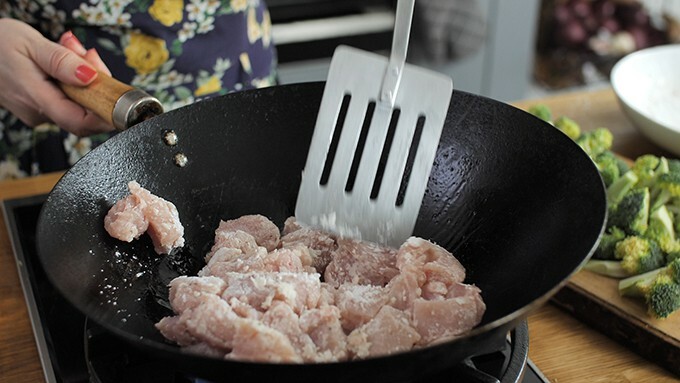 You may have to stir in a little cornflour/ cornstarch slurry (1 tsp cornstarch mixed with 1 tsp cold water) whilst the sauce is bubbling to help thicken it, as using tamari produces a thinner sauce. This recipe works best when made and served right away. Freezing/chilling then reheating means the chicken won't be crispy. However, it does still taste really good. So if you did want to freeze it, then cool, cover and freeze. Defrost overnight in the refrigerator and reheat thoroughly in the wok or a microwave until piping hot throughout. You can add a splash of water if it's a little dry.